Yitzhak Drexler, one of the Yom Kippur War's last casualties, died Saturday in hospital. Hundreds accompany him on his last journey. Hundreds of mourners accompanied Yitzhak Drexler today, who was one of the last wounded in the Yom Kippur War. Drexler died yesterday (Saturday) at the hospital. 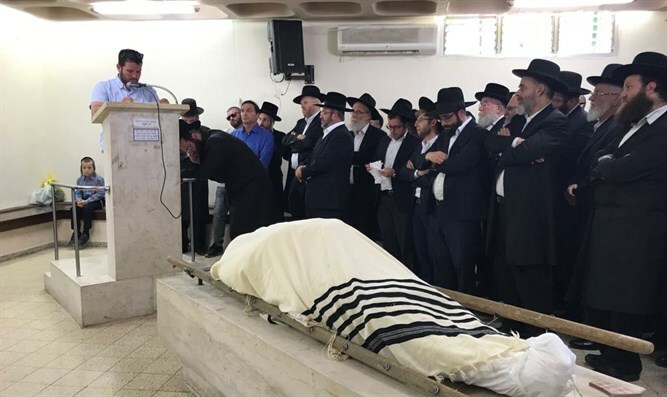 His son Hezi eulogized his father: "You were born a few years after the establishment of the State of Israel to parents who survived the Holocaust. At age of 18 the son of Sarah and Tevi from the ghetto in Hungary enlisted in the 50th Battalion and became a Jewish parachutist in Palestine. "After you married, at the height of the Yom Kippur service you were called to the Yom Kippur War and managed to fight for one day until you were critically wounded in an armor battle against Syria," said the son. The son added, "From the injury until today for 45 years we've received you as a gift. Your flame burned for 45 years. This Shabbat that war injury overcame you and you became the last casualty of the Yom Kippur War. We will always remember you and we will not forget that you - the son of Sara and Tevi from the ghetto - were a Jewish fighter in the Land of Israel and a symbol of the Jewish People's revival in its land."